The Washington Stripper-Tubing Head is a Well Head Tool that is designed to seal on the O.D. of a casing or tubing string while raising, lowering or rotating. 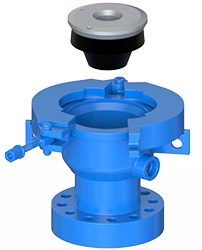 It can be used on cavitation wells, reverse circulation operations, conventional drilling operations and as a circulation head. This unit utilizes the 9010 Stripper Rubber which is a self energized seal that does not require additional means for closure. The rubber is held securely in the head by means of a two piece hinge clamp for fast and easy access. The 9010 Stripper Rubber features Washington Rotating’s patented dual sealing system, incorporating both the main skirt seal as well as an upper secondary sealing surface.